With summer drawing ever nearer and the weather starting to heat up, my thoughts are turning to updating my patio furniture. I find the easiest way to do this is add new patio furniture cushions to my deck and keep my original furniture in place. There is no need to spring for an entirely new set of furniture when simply opting for new chaise lounge cushions and recliner cushions is all that is needed. There are so many different styles that I can choose from; I can completely change the look of my deck each summer just by switching out my cushions. 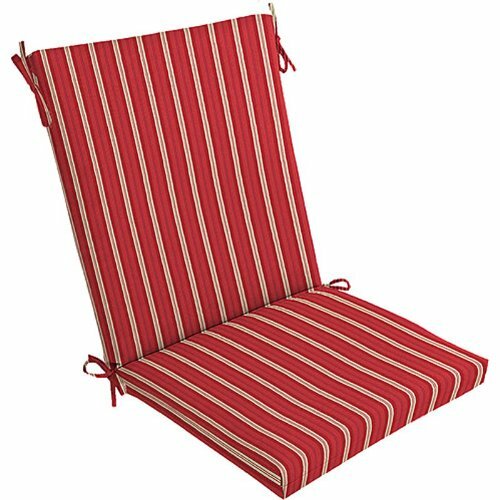 One of my favorite looks for patio cushions is the nautical look. There is a really great style that is available with nautical striping on one side and a complimentary floral paisley pattern on the opposite side. If I am feeling in a beach inspired mood, I simply place on the stripe sides face up. When I want to mix my look up a bit, I flip every other cushion over to reveal the paisley side. The contrast of the two patterns is quite striking and it makes for a lively deck. Another selection of patio furniture cushions that I have in my arsenal is a set of the overstuffed tufted style. These were available in patterns and prints, but I chose to go with a solid color instead. The solid color combined with the sumptuous overstuffed fabric makes these an out of the box hit. They just look luxurious and are even cozier to recline on. If you have ever wondered what it feels like to lay back on a cloud, then you have to try a set of overstuffed cushioned patio furniture; pure heaven awaits you. A neighbor of mine opted for a totally different take on her outdoor furnishings. Her deck furnishings are rattan and are cut quite deep so she was able to utilize really thick cushions on her patio. The edges of your cushions are squared and are almost twice the depth of my cushions. They fit perfectly with her rattan furniture and create a really luxurious look on her deck just by how sumptuous they look. If you have similarly styled rattan or wicker furniture, they are definitely an option to consider. If you are looking for a more budget friendly option for cushions for your deck, you can try a style that my daughter used on her deck. She is in her first condo with just a small patio, so she has two small deck chairs with flatter cushions on them. With a small bistro table in between, her two deck chairs provide her the perfect spot for a morning cup of coffee in the sunshine. The cushions that she chose are only about two inches thick but they work perfectly with the chairs she has and they were much easier on her budget than if she had opted for thick luxurious cushions. If she ever moves into a larger place with a bigger deck, I just might donate one of my current sets of patio cushions to her. After all, it would give me an excuse to buy another new set for my deck instead. No matter which style of patio cushions you opt for, it is important to work with a style that not only suits your deck furniture but also reflects the needs of your family. My family is in and out of the house and the backyard pool all the time, so I have opted for water resistant outdoor patio furniture cushions. They can take a beating from the pool water and yet still keep looking fresh. They have sun protection built right in so not only do they help to repel the moisture but they also do not fade in the bright sunlight. I could not be happier with them. I knew how tough my family was going to be on my deck, so I opted for cushions that I knew would stand up to the challenge. As long as you do the same, your deck will reflect your personality and look great.